Pray for One is a unified prayer that unleashes an exponential movement of God's love. Praying God's expressed will into your life will bring transformation to you and to every One that encounters God through you. See how a simple prayer can position individuals, families, and churches to impact eternity by effectively sharing God's love One person at a time. The message of All In is simple: if Jesus is not Lord of all then Jesus is not Lord at all. It's all or nothing. It's now or never. Kneeling at the foot of cross of Christ and surrendering to His Lordship is a radical act of dethroning yourself and enthroning Christ as King. It's also an act of disowning yourself. Nothing belongs to you. Not even you. 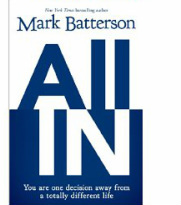 Batterson writes, for many years, I thought I was following Jesus. I wasn't. I had invited Jesus to follow me. I call it inverted Christianity. And it's a subtle form of selfishness that masquerades as spirituality. That's when I sold out and bought in. When did we start believing that the gospel is an insurance plan? It's a daring plan. Jesus did not die just to keep us safe. He died to make us dangerous. 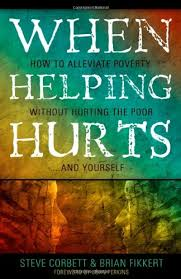 When Helping Hurts is a paradigm-forming contemporary classic on the subject of poverty alleviation and ministry to those in need. Emphasizing the poverty of both heart and society, this book exposes the need that every person has and how it can be filled. The reader is brought to understand that poverty is much more than simply a lack of financial or material resources and that it takes much more than donations and handouts to solve the problem of poverty.